Last month, China landed on the seldom-seen far side of the moon that never faces our planet. Now, a new photo from a Chinese satellite captures a rare look at both full discs as seen from behind the moon. The result is a view of our planet and its natural satellite in their entirety from a new angle. The image above was snapped by a camera aboard the Chinese DSLWP-B / Longjiang-2 satellite on Feb. 4. It might just be the first image of the moon’s backside together with Earth that we’ve seen since another Chinese spacecraft, Chang’e 5T1, took a shot of both bodies together in 2014. Longjiang-2 had to take a little break from photography for a few months to avoid interfering with the landing of Chang’e 4, but now appears to be back at it. Getting the image did take some effort, though. The Dutch Dwingeloo Radio Telescope downloaded it at the agonizing speed of less than one kilobyte per minute. “Downloading these 16 kilobytes took almost 20 minutes. We did color-correct the original,” one of the telescope operators, Tammo Jan Dijkema, said on Twitter. 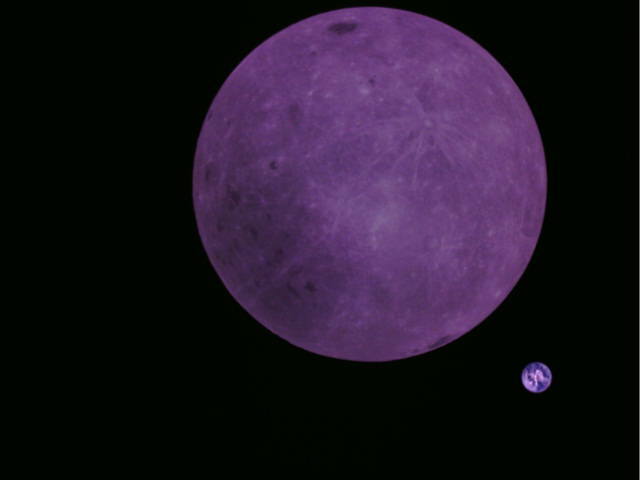 He also shared the original image of a much more violet-looking moon and Earth. This is the original resolution (640×480 pixels with heavy jpeg compression). Downloading these 16 kilobytes took almost 20 minutes. We did color-correct the original.